We just got a new Sunseeker and tried hooking up an external filter. I couldn't get it to stop dripping, so took it off again and just used the water tank. Any suggestions or do they all drip? We are trying out all the systems to learn everything we can and to see if anything needs fixing while under the warranty! Site team has combined 2 separate threads. We just got a new 24 ft. Sunseeker and I am wondering where the internal water filter is, assuming it needs to be cleaned out yearly. I do see that a lot of people remove the internal one, but we had a huge amount of mineral collection in our Rpod faucets and toilet inlet after the dealer worked on the water pump and left out the filter. It blocked everything up and was a pain to get it cleaned out and operational before we sold it. We hadn't been using the trailer water or toilet, so there must have been an accumulation of mineral deposit that didn't get filtered out. Also, I hooked up an external filter at the faucet at a campground on our shake down trip and it kept dripping no matter what I did. Is there a way to stop the dripping? I ended up just using the water in the tank instead of the fresh water hookup. What kind of filter? Was it an inline filter like this? or a whole house filter like this? Also where exactly was it leaking? Do you have gaskets in all your hose connections? It is the blue external filter. I put it on the faucet attached to the pressure regulator. Is it better to put it directly on the MH water intake? I did not put on any gaskets, assuming that it was set to go. After really working at tightening all the connections, it still was leaking at the top of the filter. I have gaskets that I use on the garden hose nozzles. Can those be used on the filter, too? Thanks for your help! Yes use those. It should work there needs to be a gasket to stop the water from dripping. Also, it might be worthwhile to put one of those kink-free adapters on it as well to take some of the weight off the connection when attaching it to the water spigot. I use the blue Camco hose filter. I consider it a prefilter. I connect a pressure regulator to the water source outlet then a blue Camco filter. I follow that with the hose to the RV. Hose washers are a must and they fall out all the time so I always keep a bag of half a dozen spares that you can get for about $5. 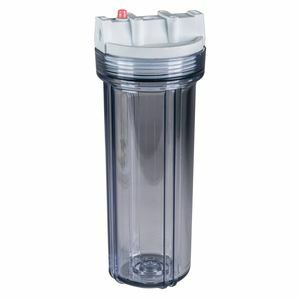 I also use my RVs whole house filter and use a Camco 40624 Evo Premium Replacement Water Filter Cartridge. Unlike many, we use the water in the Freshwater holding tank for everything including cooking and coffee. I'll have to check to see if our Sunseeker has an internal filter. There is no mention of it anywhere. Thanks for the advice!